Before I quit my job I really thought the same thing as everyone else. I thought by being a stay at home mom, I would wake up at a leisurely pace and sip my coffee. Build a lucrative art business by painting all day while my children play quietly. Have adventurous outings, bonding with my kids. Cooking deliciously healthy meals for my family. Enjoy a glass of wine with my wife as we catch up on details of our day. Although being a stay at home mom may sound like a luxurious stress-free job, I can assure you it’s not. Most days are chaotic. Any parent knows that raising children requires a lot of work, patience, attention and care. What I didn’t realize as a working parent was how much more exhausting that can be when it’s 24/7. Now that I stay at home with my children, I don’t leave in the morning to work eight hours a day in a building. I miss the drive to and from work, alone in my car jamming out to my music. Going out for lunch with friendly co-workers grabbing a light drink at a nearby bar. Having a large amount of time to work with no interruptions, to stay focused and be productive. Instead, I desperately try my best to squeeze in some work in between chasing a very active toddler around the house. Usually racing to rescue her from falling off my bookshelves, TV stands, climbing into the dishwasher or running with breakable things. Re-washing all kitchen items thrown in the trash from mommy’s proud little helper who helped clean up. I juggle between changing diapers, spills, thrown food, baths, laundry, prepping meals, cleaning up, transporting my 7-year-old to and from school, piano lessons, figure skating, and theater. Not to forget this comes with daily homework, piano practice and giving dramatic performances in the living room in prep of future plays. I’m also in charge of doctor appointments, parent-teacher conferences, grocery shopping and sick days. 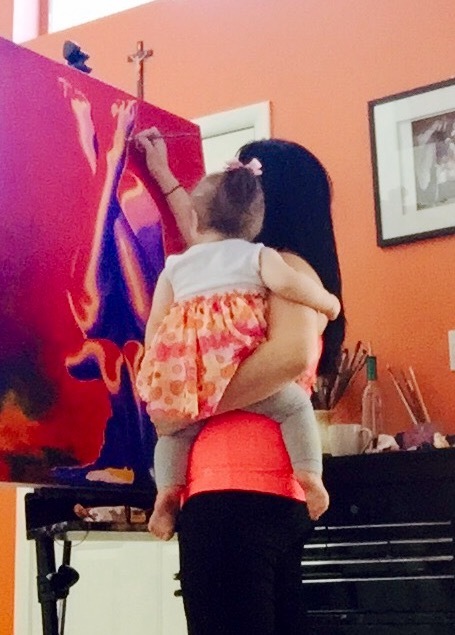 Building an art business on top of being a stay ay home mom is quite difficult. It’s a skill you have to practice every day and every day it is a challenge. As an artist, my job is to sell emotions. That alone should let you know how difficult that can be. I don’t just paint paintings and then get paid. I wish it were that easy, really I do. Being a self-taught artist, I am really left on my own to market myself and build up my own collectors. This does not happen by just painting at home and hoping clients or gallery owners come knocking on my door. You must be seen. My everyday goal is to have my art viewed by as many people as possible. To have people engaged in my work. Socializing and networking. Visiting local galleries, meeting local inspirational artists. Reaching out to gallery owners and curators. Scheduling business meetings to book future shows. Meeting deadlines, transporting paintings and setting up. Participating in art festivals, street festivals, social media promoting all work and upcoming events. All takes time, money and planning. As does the actual creating. Once inspired I must find a model, schedule for a quick shoot, purchase my supplies and paint. One painting can take weeks, and sometimes months to complete. I must then schedule time with a photographer and get professional shots of my finished work. Take those shots to a print shop and order archival gallery-quality prints. Properly package prints myself, ready for sale. I have to be consistent, always creating. I have learned if you’re not creating people will forget about your work. Finding time for all of this while being a stay at home mom is no easy task. It’s no secret that children don’t let you work, no matter what kind of work you do, they just don’t. Daytime is limited and my time is very much on my children’s schedule. Most days it’s one load of laundry done, not all of the laundry. Picking up all toys, shoes, snack wrappers and food off the floor but not mopping it. Clearing the counter from crayons papers more toys food and dishes but leaving the sink full. I have learned to accept not everything can be done in a day, but to find balance in everything you do so that nothing gets forgotten or neglected. I look for every bit of opportunity to squeeze in time to work. Rushing to set up my paints and paint while my toddler eats her meals. Having the highchair perfectly spaced from my easel to avoid spaghetti sauce thrown at my canvas (it’s happened before). Posting on social media, while in the bathroom with my toddler shouting “Hi” from under the door wiggling her tiny fingers. Hoping I’m making the best choice on how to spend nap time knowing I only have 30 to 45 mins to squeeze in either a shower, more painting time, a load of laundry, sink full of dishes, or blogging. Making art videos late at night or right after dinner, while my wife takes over with our kids. Although exhausted from the tears, dramatic no’s, sibling rivalry, and endless errands. Every night when I drop on the bed, clothes stained with food, juice, and paint, I can’t help but feel appreciative and blessed to do this every day. I get to be here for every milestone, kiss every boo-boo, swoop my baby up in my arms to give cuddles throughout the day. No more daycares. I get to pick up my oldest from school, watch her run with excitement smiling and waving, eager to tell me about her day. Take her to all her lessons, watching her confidence grow and accomplishing her own personal goals. I’m so very grateful that I have a supportive, loving wife who will stay up late with me to talk about grown up things and make me laugh so hard we both cry and ache trying not to wake our girls. Fall asleep and start the day all over again. Being a stay at home mom and trying to build a business is far from easy. We have absolutely no free time. We work just as hard as anyone (and sometimes harder) to make every day a successful one.